Rebecca Coleman is the author of THE KINGDOM OF CHILDHOOD, an utterly absorbing look at the breakdown of a woman and a family, beautifully written novel that explores a relationship between a teenager and a teacher as it veers from platonic to unsettlingly forbidden territory. So today I got an opportunity to join her virtual tour and get to ask her some questions. D: Your manuscript for the TKOC was a semifinalist in the 2010 Amazon Breakthrough Novel Competition! Tell us a little more about this. RC: That was a lot of fun. My friend Erika suggested I enter my manuscript-- the contest hadn't been on my radar at all-- so I did, because it's free and I had nothing to lose. And then the book ended up making it through one round after another until it was a semifinalist. I'd gotten a Publisher's Weekly review as part of that process, and it was a very strong one-- they called the book "a scalding, engaging portrait" of two people "caught in a trap of their own making." Having that review in hand was extremely helpful in getting an agent. But the process was also just very fun and exciting-- it was like a horse race, betting on which entries would make the next cut, because Amazon posted excerpts at one stage. One of the finalists that year was Johnny Shaw, who I ran into at BookExpo as he was promoting "Dove Season." He's a great guy, very funny. Entering ABNA is like being on "Survivor"-- you make friends and alliances, and other people you want to vote off the island on the first day. D: How long did it take you to write the book? RC: From concept to completion, about two and a half years. That's not a very long time, on the scale of novel-writing, but it feels like a long time when you have no idea whether this is a work project or just an obsessive hobby. D: Did you do any special research on Waldorf for the book? RC: I read Torin Finser's "School as a Journey," which is a very detailed look into a Waldorf teacher's mind and classroom, and I read a great deal by Rudolf Steiner, who is the originator of the philosophy. But I also spent a lot of time reading forums and websites by people who felt disenfranchised by Waldorf and critical of it. Because I idealized it for so long, it's oddly painful to be critical. I felt I did my due diligence with research, but mainly I relied upon my real-life experience with it-- attending school events and festivals, observing my son's classroom, and working with the materials-- the toys and art supplies, the storybooks. It's all been a part of my life for many years. "Yeah, but it's still safer if you use them." "Safer for what? I don't have any diseases. Do you?" In a scornful voice he said, "No. But they say you ought to act like everybody does,anyhow." I gave a deprecating laugh. "Oh, the things they teach you teenagers." Rebecca Coleman received her B.A. in English literature from the University of Maryland at College Park and speaks to writers' groups on the subjects of creative writing and publishing. A native New Yorker, she now lives and works near Washington, D.C. 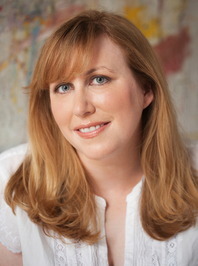 Her manuscript for The Kingdom of Childhood was a semifinalist in the 2010 Amazon Breakthrough Novel Competition. An emotionally tense, increasingly chilling work of fiction set in the controversial Waldorf school community, it is equal parts enchanting and unsettling and is sure to be a much discussed and much-debated novel. The Kingdom of Childhood was compelling, love Rebecca's writing. Absolutely loved reading about the author's experiences with the Amazon competition. While not my genre the book sounds fascinating. Great interview. great interview, this looks intense!